Day 1: Fly to Chicago. On arrival transfer to your hotel. 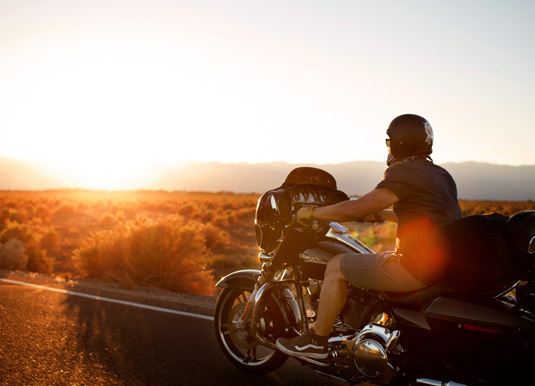 Day 2 Chicago/Springfield: Pick up your bike and begin the ultimate American road trip. Head south along the Pontiac Trail, the original name for this bit of the road, passing through Joliet and stopping at the RT 66 Museum in Pontiac (187 miles). Day 3 Springfield/St Louis: Traverse cornfields and small towns representing the USA's heartland. Arrive into St Louis over the original bridge where RT 66 crossed the Mississippi River (116 miles). Day 5 Joplin/Oklahoma City: Head west through Oklahoma, passing through the towns of Miami, Claremore and Catoosa, where the legendary Blue Whale resides. Pass through the lands of several Native American tribes and then further west ride through El Reno – over the mile-long bridge, near Bridgeport and into Oklahoma City (255 miles). Day 6 Oklahoma City/Amarillo: Travel along some of the oldest stretches of Oklahoma's Route 66, once the land of vast buffalo herds. Ride along a section of the Chisholm Trail, which passes through Yukon and El Reno, and stop at Clinton's amazing Route 66 Museum. Cross into the Texas Panhandle, the southernmost portion of the Great Plains (266 miles). Day 7 Amarillo/Santa Fe: Head into New Mexico and the land of the Comanche Indians. Ride into the High Plains and altitude of Santa Fe, one of America's oldest cities (303 miles). Day 8 Santa Fe: At leisure to enjoy this south western city. Day 9 Santa Fe/Gallup: Head south to Albuquerque. Later, cross the Rio Grande and travel west out into the Navajo wilderness. Further on ride through Grants and along Cibola National Forest towards Gallup – an old railroad town and Indian stronghold (271 miles). Day 10 Gallup/Grand Canyon: Cross into Arizona and ride to Petrified Forest National Park, a fossilised prehistoric forest of gigantic trees. Continue west to your hotel just one mile from the South Rim of the Grand Canyon! (283 miles). Day 11 Grand Canyon/Laughlin: Optional helicopter ride over the South Rim (extra expense). Later, ride along the rim for amazing vistas before picking Route 66 back up in Williams. Stop in the towns of Seligman, Peach Springs, and Hackberry (256 miles). Day 12 Laughlin/Las Vegas: Take a detour in Las Vegas...but first ride through the Old West Ghost Town of Oatman, and journey across the famous Hoover Dam! (129 miles). Day 13 Las Vegas/Victorville: Cross the border into California and traverse the Mojave Desert which offers some of the most dramatic scenery in Southern California (282 miles). Day 14 Victorville/Los Angeles: Ride the Angeles Crest Highway, considered one of the top motorcycle rides in southern California. Next, descend into the Los Angeles Basin and head for the Pacific Ocean and the "End of the Trail" sign on the Santa Monica Pier (124 miles). Day 15 Los Angeles: Travel to the airport for your onward journey. Departures: On selected dates. Please ask for details. Tour Price: The price shown is based on the best value travel dates in low season and includes international flights, motorcycle rental, helmets for the driver and passenger, multilingual professional tour guide, support van and spare motorcycle, professionally designed route, EagleRider riding jacket and hotel accommodation.